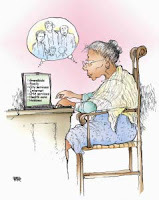 This image is what I first saw when I visited Don Samuelson's Get Seniors Online blog today. I've known Don for more than 12 years but it wasn't until we had lunch today that I learned of this blog. It's quite interesting. And it gets regular feedback which I'd like to see more of on my own blog. The focus of Don's blog is to help seniors learn the basic skills of navigating the internet high way, so that with their "Drivers License" they can take of on life-long learning road trips of their own choosing. My interest is to provide a road map so that some of the seniors who already are online, or will get online because of what Don is doing will find the Tutor/Mentor Institute blog and web site and will begin to use the information posted to expand the role they take in making mentor rich, technology rich, non-school learning programs available to youth in high poverty neighborhoods all over the country. In one blog post Don wrote he asked "What is the potential $$ value to seniors themselves?" from being an online senior? How might this affect healthcare costs, costs of entitlement programs, economic well-being, mental health? One respondent to Don's post said "It's Priceless" and went on to say "And what is the value to the resident who was closeted in her apartment and now she has come out for awareness raising and training, and is engaged in learning, saying hello to fellow residents, and is starting on her road back to "being connected?" I'd go a step further and as "How much more value might be gained by connecting the talent, wisdom, love and involvement of a growing number of seniors in helping youth who need extra adults in their lives have places to connect with adults from 18 to 100? I look forward to connecting Don's world of Seniors OnLine with my world of Tutor/Mentor Institute. I hope you'll join in. Innocent teen killed in Maywood. What Can Be Done? Today the Chicago SunTimes and the Chicago Tribune both included stories about a 14 year old teen killed while she slept in her home by a car that crashed into the house as a result of the driver being shot. This story is tragic, but it also is personal. The teen was part of the Maywood Youth Mentoring Program that has been led by Barbara Cole for many years. Through the Tutor/Mentor Connection I've tried to help Barbara build the program she leads so it can help more teens. This program has also been aided by Michael Romain, who also volunteers time to write about the Tutor/Mentor Connection. 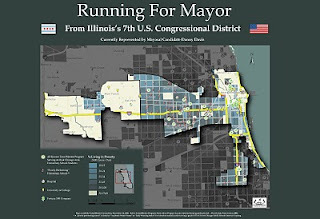 Below is a map showing the 7th Congressional District that was created last year during the campaign to elect a new Chicago Mayor. This map was created several years ago to illustrate ways that leaders in different political districts should be working with business, faith groups, and other elected bodies to help build and sustain a wide range or mentor-rich youth programs in the high poverty parts of the district. While the SunTimes devoted a half page to the tragedy in Maywood, they devoted two pages on Tuesday and another two-pages today to talk about the tragedy taking place in the Englewood neighborhood of Chicago. They've focused on Murray Park as a symbol of the lack of safe places for kids to play and build skills during the non-school hours. I've created maps of Englewood in the past. 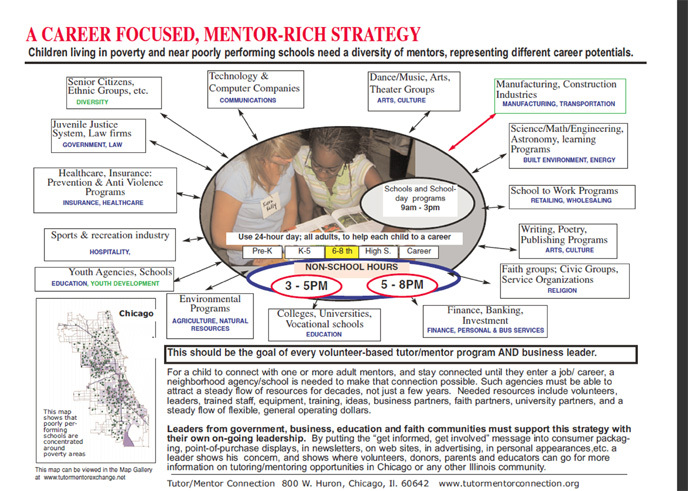 The one below is from the Interactive Map on the Chicago Tutor/Mentor Program Locator. In the Interactive Program Locator each green star represents the name of an organization that offers some form of tutoring and/or mentoring. Some have web sites and you can learn more what they do. Some don't. We intend the Program Locator and our maps as a tool for leaders. 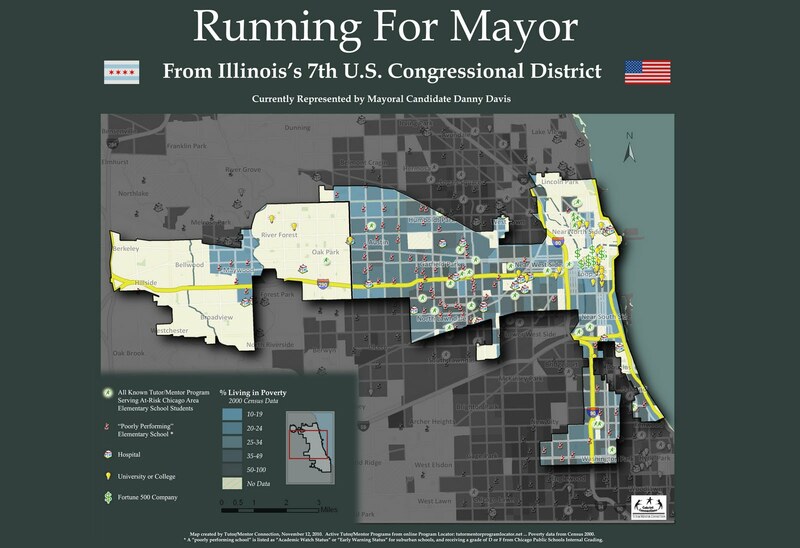 Anyone can look at the map of the 7th District and see that there are very few programs and they are not in every part of the district. Same for Englewood. I've been hosting a Tutor/Mentor Leadership and Networking Conference every six months. My goal is to bring people together to talk about where tutor/mentor programs are needed and to share ideas and strategies that can help existing programs grow. However, the goal is also to create reasons for newspaper reporters to write stories about tutoring/mentoring and to help us draw more people to the conferences and to the list or programs we host so more people learn to become volunteers and donors helping each tutoring and/or mentoring program constantly improve in an effort to be 'world class' in what they do. 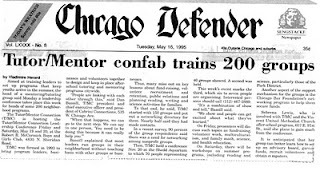 The story below was written in November 1996 by Ray Coffey of the Chicago SunTimes. The next conference is Friday, November 4 at the Metcalfe Federal Building in Chicago. 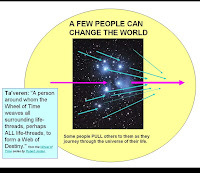 You can see more stories written as a result of the conferences and other actions of the Tutor/Mentor Connection at this link. I hope some of you will forward this information to bloggers and media writers so new stories will be created. I hope you'll also encourage people in business, media, philanthropy and who lead tutor/mentor programs to register and attend so more people will be working to change what is happening in Maywood, Englewood and many other neighborhoods of this country. 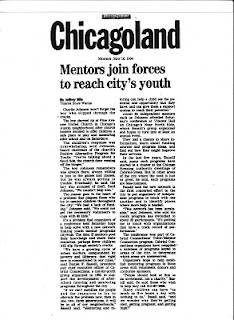 As I'm reaching out to invite people to participate in the next Tutor/Mentor Leadership and Networking Conference, which will be held on November 4 at the Metcalfe Federal Building in Chicago, I've been pulling media stories from past conferences. Here are a few. Click on the image to enlarge. 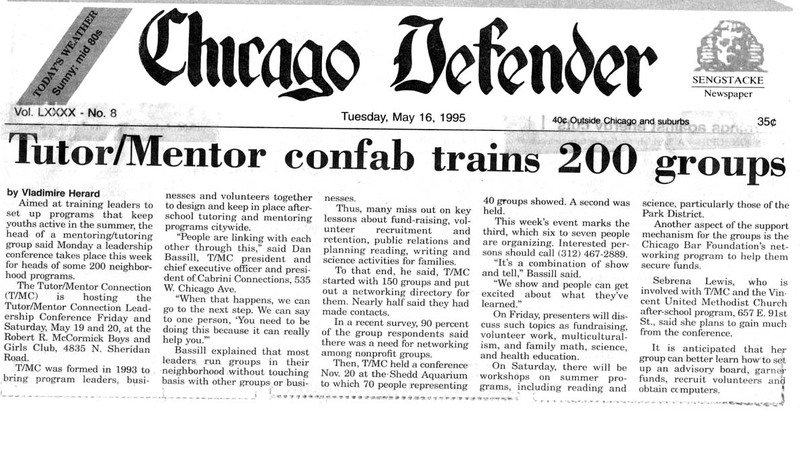 Chicago Tribune story from the first conference in May 1994. In recent years most of our communications have been through blogs and email and we've not had as many stories in local papers. Yet the issues of education, poverty, wealth-gaps, workforce readiness and diversity continue to grow more critical. It's time for more people to help with telling the story and pulling people together to learn ways to build and sustain high quality volunteer-based tutor/mentor programs in more places. 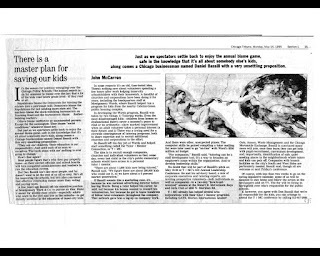 Below is an article written in 1995 by John McCarron and published in the Chicago Tribune. 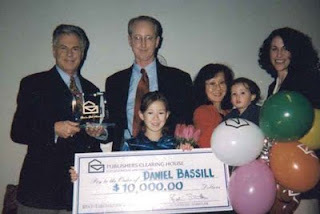 The headline says ""Just as we spectators settle back to enjoy the annual blame game, safe in the knowledge that it's all about somebody else's kids, along comes a Chicago businessman named Daniel Bassill with a very unsettling proposition." 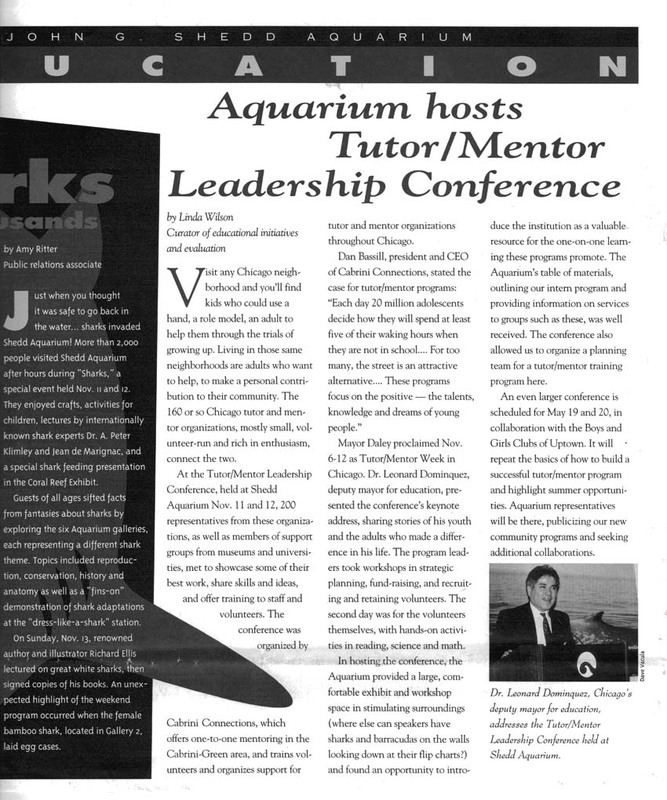 In this article McCarron wrote about the May 1995 Tutor/Mentor Conference, which was only the third that I had hosted since we launched the T/MC in 1993 -- and which I've hosted every six months since then. He wrote "For companies, "Bassill said, "tutoring can be a staff development tool. It's a way to broaden an employee's scope within the organization. And to develop leadership skills." 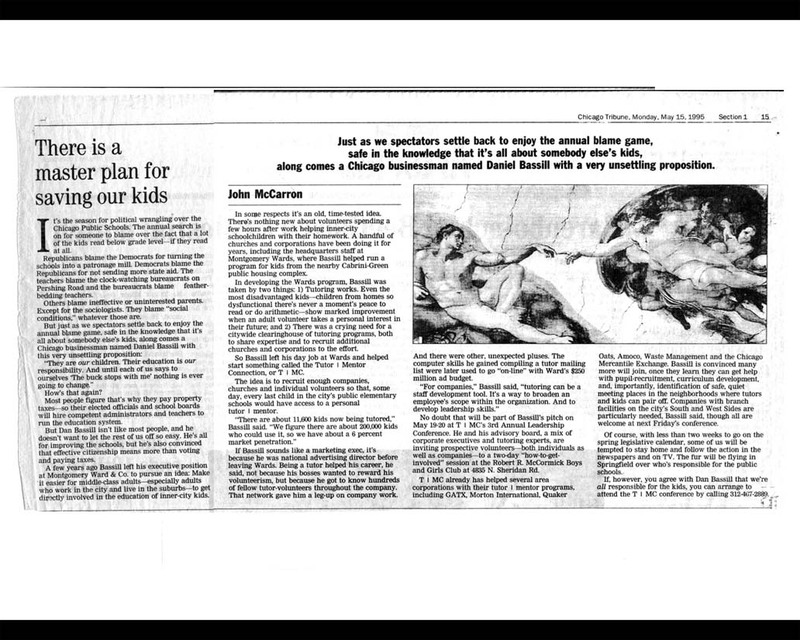 Below is another article, this time that was in Crain's Chicago Business in 1998. The headline was "A 'trade group' that distributes knowledge to kids"
This article included a quote saying, "In Chicago, there are just 12,000 kids in after-school tutoring programs. That's out of 500,000 school-aged kids." 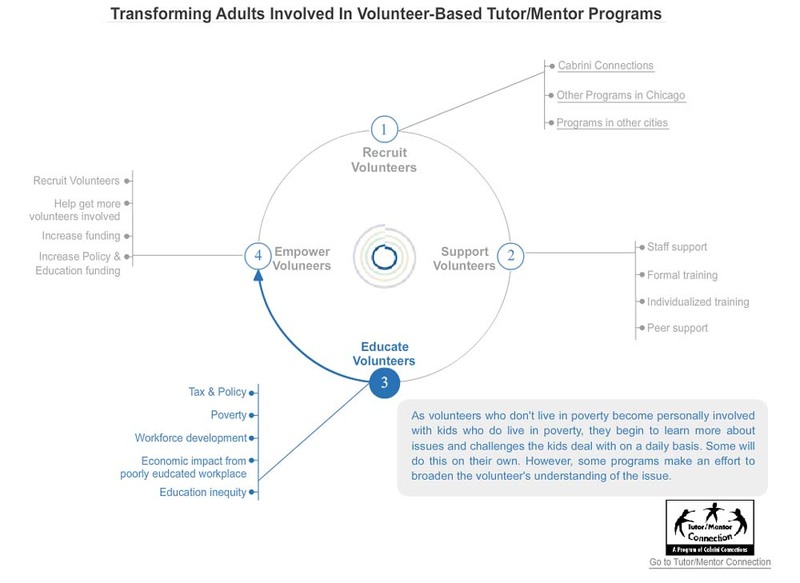 That information was drawn from a 1997 survey conducted by Human Capital Research Corporation, Associated Colleges of Illinois and the Tutor/Mentor Connection and focused on "structured volunteer-based tutoring and/or mentoring programs". The number of kids in Chicago Public Schools has lowered to around 400,000 now, but the problem has not changed. 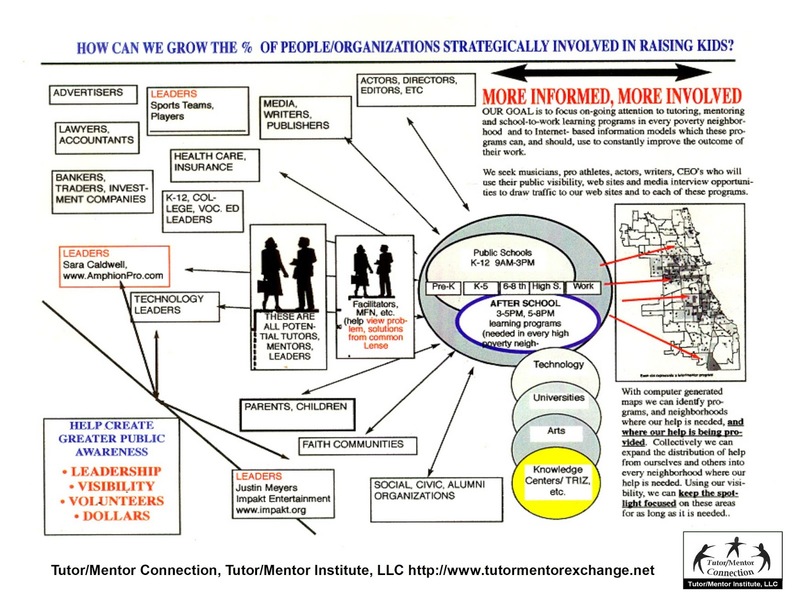 There still is no intermediary organization and business leadership working to build a distribution of volunteer-based tutor/mentor programs operating in high poverty neighborhoods and connecting business ideas, technology, volunteers and jobs with kids as early as in elementary school. While these are two of many articles that have been written about my efforts, I've never been able to build the philanthropic or business investment to do all of what we've wanted to do to support this effort. I've created the Tutor/Mentor Institute, LLC in an effort to expand the ways I find partners and revenue and I'm hosting the next Tutor/Mentor Conference in Chicago on Nov. 4 at the Metcalfe Federal Building. If you want to inject new energy and needed capital into this effort, or adopt it in your own city, then become a sponsor, or participate and learn ways you can become involved in the future. 9-13-2018 update - I'm still trying to find sponsors, partners and contributors to help me do this work. Here's a page where you can help FUND Me. If you've followed what I write you see my passion for visualization. However, my work is crude compared to what you see in this video. How can we connect with this talent and focus some of their effort on our goals? Imagine yourself 100 years ago listening to Thomas Edison talking about the need for an electricity industry and infrastructure to enable light bulbs to be in every home, street corner and business of the country. Most people at that time did not know what a light bulb was. How many were thinking of transformers and power plants and all the thousands of little details that add up to today's giant electricity industry. I face the same challenge. Maybe you can help me communicate this better. 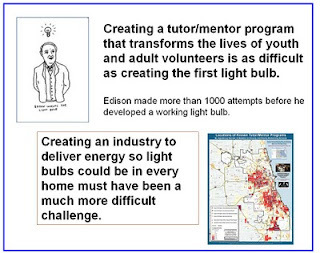 To me the "light bulb" is a tutor/mentor program. 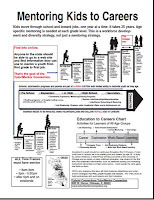 We still don't have a 100% proven method of connecting youth and volunteers in non-school neighborhood tutor/mentor programs of high poverty neighborhoods in ways that result transforming the life and future of the youth, and the volunteer. 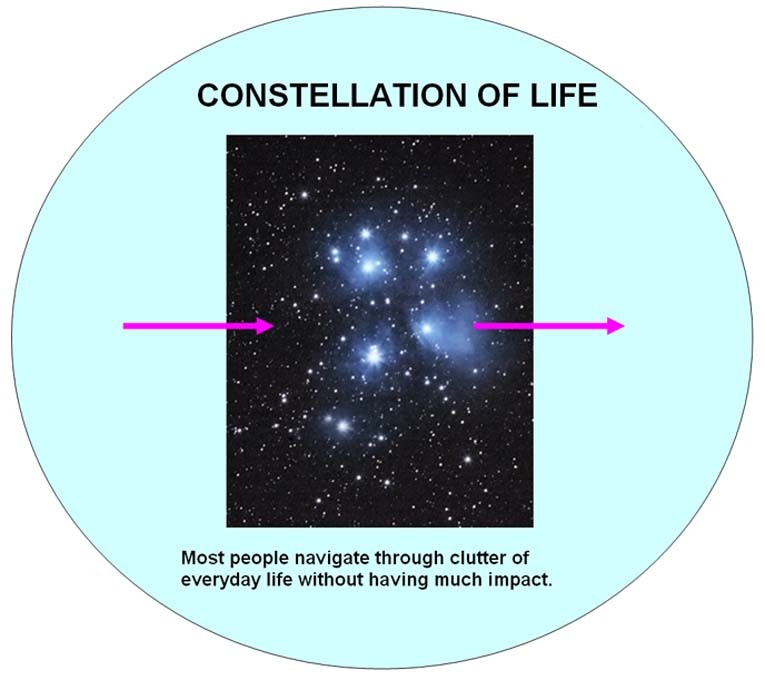 We probably have a hundred different definitions of what we mean when we say "transforming the life". Yet, these programs won't be in most of the places they need to be and they won't have the resources to hire and retain quality staff to support tutors/mentors and student, or to support the operations of the organization, unless we create an industry dedicated to this purpose. Is this something you're thinking about? Now, how can if earn some revenue to pay my own bills, and cover the costs of the ideas we generate and the tools we've developed at http://www.tutormentorexchange.net while helping you apply this thinking to your own industry-development effort? 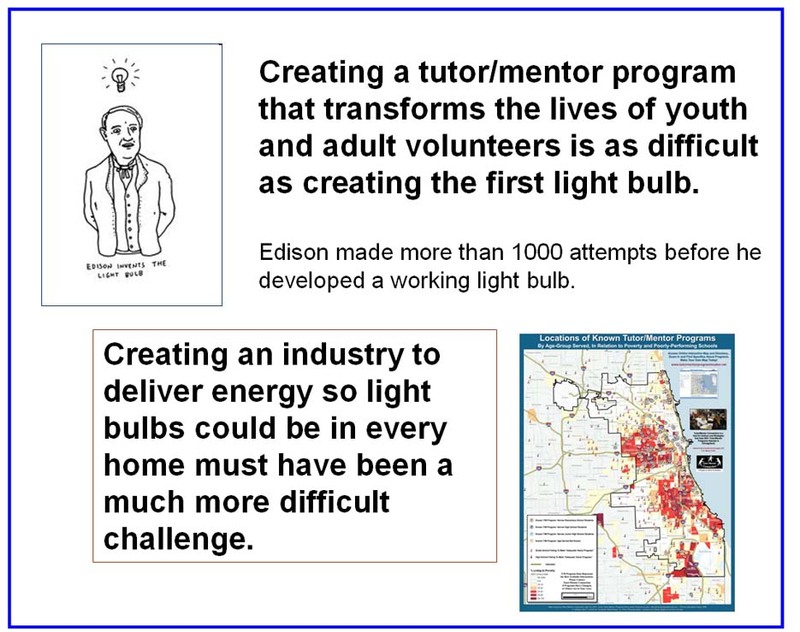 If you were Edison, how would you describe what you're doing and what you want others to do to help you? This is the first time in 37 years that I've not led a tutor/mentor program and been organizing student and volunteer orientations this week. As I've written in these articles I'm no longer directly involved in leading the Cabrini Connections program. Yet this week and next week they and almost every other tutor/mentor program in the country will be going through the annual ritual of interviewing and screening students and volunteers, organizing orientations, and doing the initial matches and start up activities that launch the new school year. 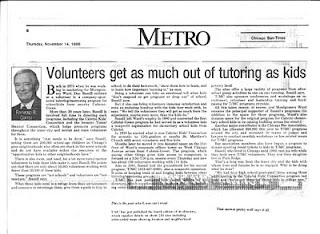 Through the Tutor/Mentor Connection, which was formed in 1993, I've tried to help these programs get volunteers and operating dollars. I've tried to help them find and use information they can use for training and supporting volunteers. I've aggregated information the students and volunteers can use in their own weekly activities. 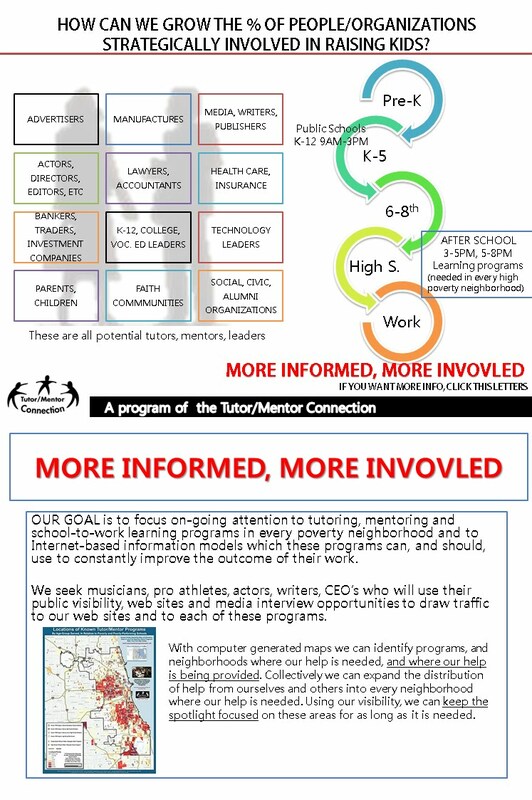 I've created the Tutor/Mentor Institute, LLC to provide some structure to continue this work. Read the blog articles I've written in the past month and in past years and you'll see that my commitment to helping inner city youth from birth to work has not changed, just my financial resources and ability to support this effort. If you're reading this article please keep this visual image in mind. Every tutor/mentor program in your community needs the same resources. Not everyone can be a one-on-one or group tutor or mentor. However there are many ways everyone in the entire metropolitan area can help build visibility for these programs, provide infrastructure support, and provide the operating dollars each program needs to build and sustain strong on-going programs. Visit the Program Locator and use the maps or search screen to find information about tutoring and/or mentoring programs in the Chicago region. Research the programs. Learn what they do. Make a commitment to help one or many. If you find out of date information or if you know of programs not in the directory email me at tutormentor2@earthlink.net to help me keep the information updated. If you're a tech person/company become my partner and help me develop and maintain these tools. If you want recognition become a sponsor and help me hire staff to do this work. I'm not leading a single tutor/mentor program as we start this new year. I am continuing to lead a strategy intended to help high-quality and constantly improving tutor/mentor programs reach youth in more high poverty areas. I need your help. So do each tutor/mentor programs in Chicago and in other cities. Good luck to all of you as you launch this new school year. The problems society faces are complex and will take the work of many people working collectively for many years to even make a dent in some of them. That's why it is so important to begin to engage young people in this process. Young people will become old people in a short span of life and if they begin learning to use the internet for problem solving, team building, and advertising they can build skills that will become more and more powerful as they do grow older. Below is a graphic created by Sam Lee, and intern with me in spring 2011. This has all the key ideas shared in this blog and the Tutor/Mentor Institute site. It shows people forming into groups, based on what their occupation is, where they went to college, what faith they are part of, etc. 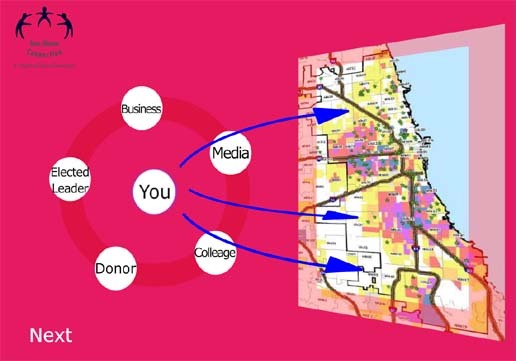 These groups use maps to understand where poverty is most concentrated, what assets are in different areas, and what ways they can inspire people every day to provide time, talent and operating dollars for one, or many, tutor/mentor programs to operate in Chicago or any other city. 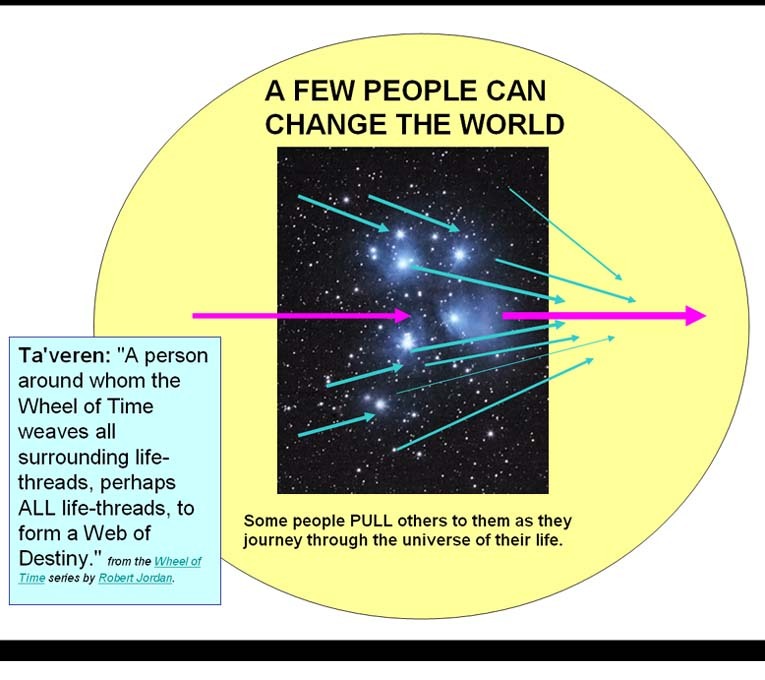 The graphic below was also created by Sam and shows that our aim is to constantly increase the number of people who are looking at this problem, looking at the research and ideas available on the internet, and innovating actions that make volunteer-based tutor/mentor programs available and more effective in more places. This type of work has been done by interns working with Tutor/Mentor Connection since 2006. I coach the work in groups on our Ning Forum, such as this one. To create her visualization Sam Lee used this one shown below, created by Dan Bassill, in the 1990s, to show how the Tutor/Mentor Connection was trying to build a growing network of people who were looking at the information being aggregated in the T/MC library, and using it in on-going discussions within business, faith groups, colleges, etc., to innovate ways to make well-organized volunteer-based tutor, mentor and learning programs available in every high poverty neighborhood of Chicago. 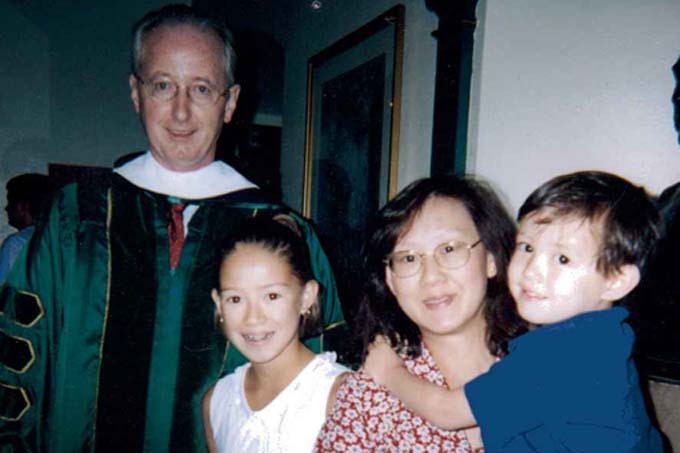 As we start the new school year and reflect on the 9/11 tragedy I hope that sponsors will come forward to help me develop a platform where interns from high schools and colleges all over the world are doing what Sam Lee and our interns have been doing since 2006. The result can be more people connecting with people and places where poverty created disadvantage and more people working consistently to create bridges of empathy and understanding where people on both sides learn and benefit. I encourage you to view this video. Then tale a look at some of the ideas I've been sharing on this blog and in the Tutor/Mentor Institute. If we want to expand the empathetic world what are the steps that some of us, or many of us, need to take to bring more people into this type of world? I've focused on volunteer-based tutoring/mentoring because of the way it connects people who don't live in poverty with places in neighborhoods with high poverty and with young people who live in those neighborhoods. If the volunteer is well supported because the tutor/mentor program is well funded and has effective, experienced leaders, I feel the volunteer will grow his/her understanding and begin to see the world the youth lives in through the ideas and experiences of the youth. This creates empathy that leads many volunteers to sacrifice more time, talent and even dollars to help the youth overcome the challenges his world of poverty creates. This graphic and video illustrates this growth. 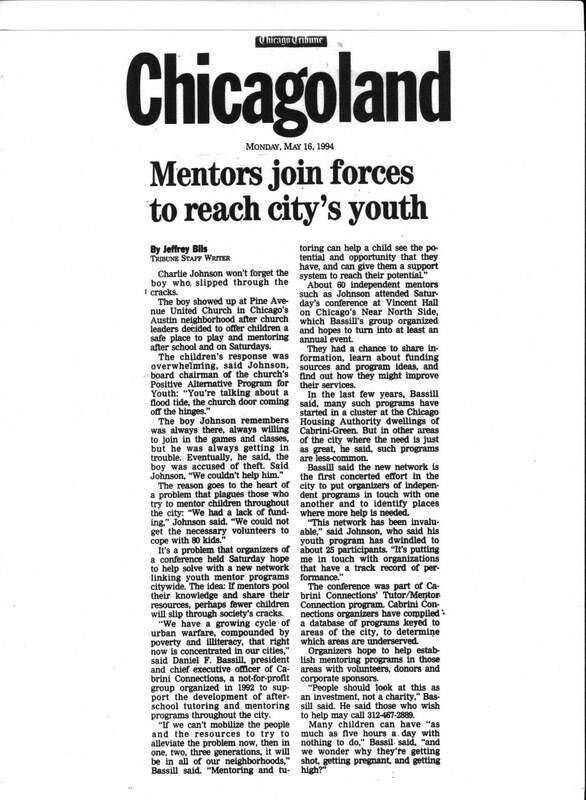 Right now tutor/mentor programs in Chicago and other cities are recruiting youth and volunteers and doing the screening, orientations and training that start the annual mentoring cycle. 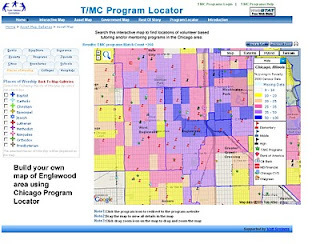 You can use the Tutor/Mentor Program locator to find contact information for places in the Chicago region where you can become a tutor/mentor and where you can offer your talent as tech support, communication, PR and marketing, or as an evaluator or book keeper. There are lots of ways to get involved. If we want to expand this empathic world it starts with the first steps we each take today or tomorrow. 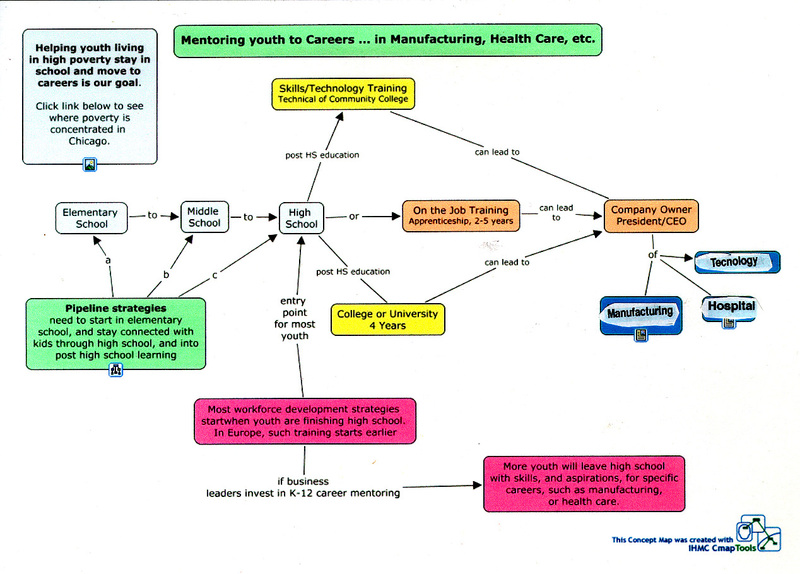 Do you think of Mentoring as a A Jobs Creation Strategy? What if we could put thousand of unemployed people in long-term jobs while also helping more youth living in high poverty prepare for future jobs and careers? In numerous articles being written this Labor Day weekend the unemployment rate is stated as being between 9% and 16% reflecting people out of work, no longer looking, or under employed. Many talk of rebuilding the nation’s infrastructure as a jobs creation strategy for putting people back to work. However, that does not address the large number of people who are in the birth to work pipeline who are not being adequately prepared for 21st century jobs and careers. What if we had a jobs program that could create jobs for currently unemployed people and do more to help youth from inner city neighborhoods move successfully from high school to college and to jobs? I’ve been aggregating information about poverty, poorly performing schools, social justice and workforce development for many years. This section of the Tutor/Mentor Connection web library contains many articles on this topic. (research library). One article I found today is titled Overcoming Intergenerational Poverty (pdf). The writer recounts her own struggle to get through college and does research to show the barriers others from areas with high concentrations of poverty face. Others are focusing on mentoring as a form of expanding social capital and my own view of a volunteer based tutor/mentor program shows youth surrounded by volunteers who come from diverse workplace backgrounds. In a small tutor/mentor program with 50-70 pairs of youth and volunteers there could be five to 10 jobs. This infrastructure graphic shows what needs to be in place. 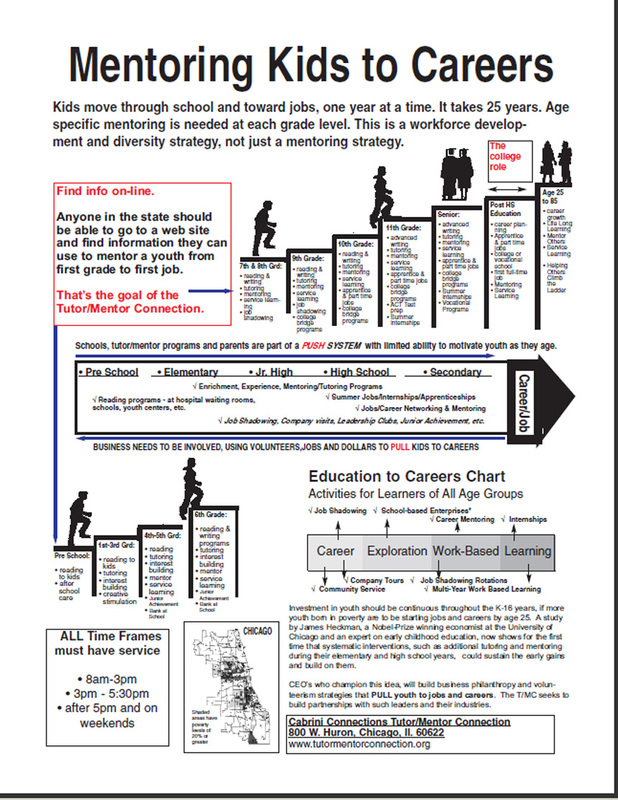 The talent chart on page 5 of this Tutor/Mentor Institute PDF does the same. Most tutor/mentor programs don’t have this range of talent and they struggle. 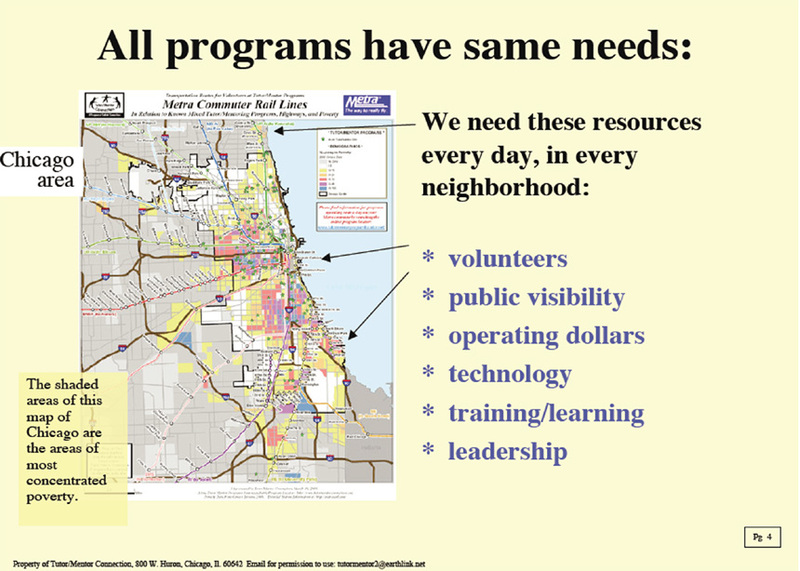 Our survey of tutor/mentor programs in Chicago shows many neighborhoods with few or no organized programs. Since there are over 200,000 youth living in high poverty in Chicago, how many tutor/mentor programs might be needed to reach 50% of these? 500 programs with 75 youth each would cover the city and suburbs and still only reach about 38,000 kids. How many jobs might be created if an effort were made to build a comprehensive network of tutor/mentor programs operating in all poverty areas of the city and suburbs. How many people might this put to work? How many internships might be created for youth in these programs? How might this contribute to the current economy in high poverty neighborhoods while also building the future workforce and lowering the costs of poverty at the same time? I’m trying to build a team of people that will help me think through these topics and will help generate the resources and public will needed to make more and better non-school tutor/mentor programs available. Maybe if we looked at this as a jobs and infrastructure program the government or some high profile foundations would take another look at this? What do you think? 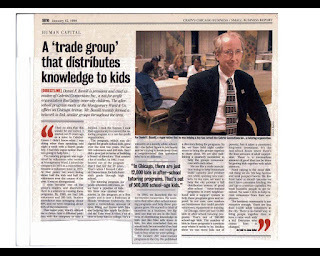 10 years ago I was preparing to go to Illinois Wesleyan to receive an honorary PhD recognizing my work connecting youth and volunteers. This photo is from that ceremony. Minor Myers, jr., President of IWU in the 1990s was one of my strongest supporters. He wrote in one note, "You've done this so well it strikes me you could provide a service to other major cities. This is first class work." At the same time, I’d just been appointed to the Illinois Commission on Volunteering and Community Service by Governor George Ryan. 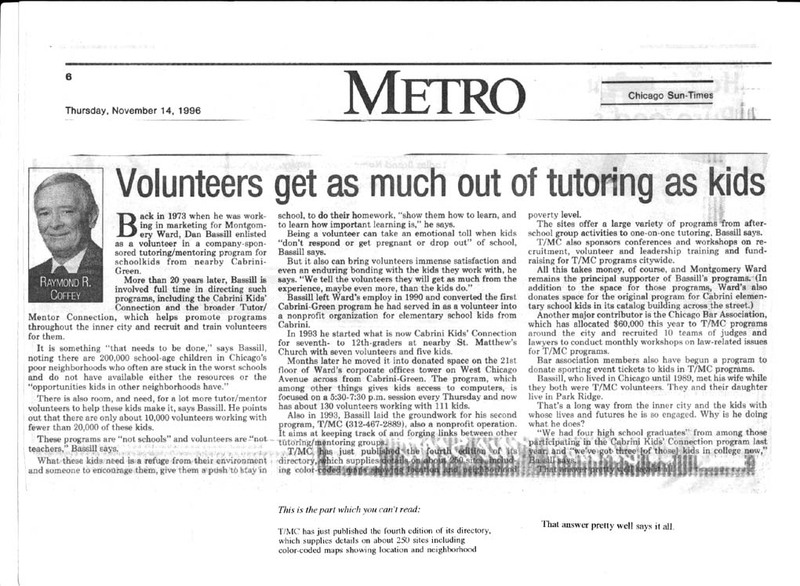 His wife was the honorary chairperson for the annual Chicago area August/September Tutor/Mentor Volunteer Recruitment Campaign that we had organized since 1995. This photo is from a press conference where Paul Vallas, CEO of Chicago Public Schools also showed his support. In 1999 I had received the Good As Gold Award from Publisher’s Clearing House on a Dec. 31 national telecast of the Montel Williams TV Show. We had received other awards prior to this and we've received other awards and recognition since. Even though the stock market had begun to plunge and we had lost our major sponsor, the Montgomery Ward Corporation, things looked good for Cabrini Connections and the Tutor/Mentor Connection. That was 10 years ago. Only a week later came the 9/11 attack on America and the beginning of a decade of struggles for us and millions of others around the world. Last December I wrote a series of blog articles and created this PDF report showing how we had continued to build connections between youth and volunteers and expand our network of tutor/mentor programs despite severe financial challenges. Then in April the Board of Directors of Cabrini Connections voted to no longer support the combined strategy of a local program and a global strategy. Read announcement. I was given ownership of the ideas and assets of the Tutor/Mentor Connection and resigned my role as President and CEO in late July. The world has changed since ten years ago but the courage of some people who want to create a better world has only been strengthened. Through the Internet the networks of people who share ideas and learn from each other has grown dramatically, as have the tools for collective action. 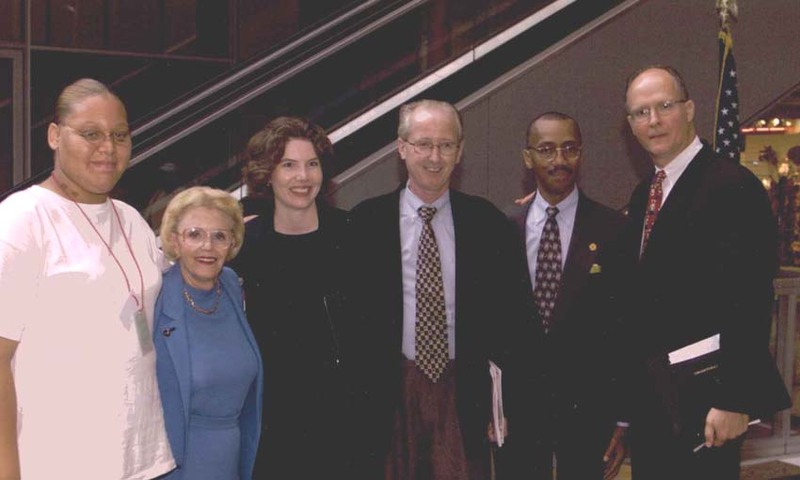 This photo shows a montage of people who have been part of the Tutor/Mentor Connection and Cabrini Connections in the past. 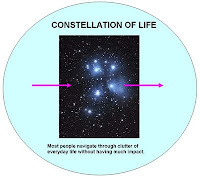 This video illustrates how networks can be mapped to show constellations of people and groups focusing on common goals. With luck, faith, and an abundance of optimism I intend to recognize 9/11 the way I did when the original attack took place 10 years ago. I’ll be sitting at my computer trying to connect people and ideas that might prevent such terrorism in the first place while keeping my ear to the events taking place and praying for the survival of those who have been so terribly impacted by the man-made and natural disasters of the past 10 years. I own much to my own family for my ability to do this work. My daughter was born the year I first launched the tutoring program at Wards as a non profit. My son was born in 1997. They have grown up while I've been spending countless hours trying to help "other people's kids". My wife has carried much of the load on the family front. I hope they realize when they are older how what I do is intended to create a better future for them, not just of "other people's kids".